Machine technical support is delivered to you through a national service team of factory trained service engineers and support staff. Wherever your production facility is located, our technical service will come to you if needed. In the rare occasion your machine stops doing what it should, simply call our service engineers and we will do the rest. With a tradition of innovation and ingenuity, we encourage all our staff to question conventional thinking and develop solutions that make positive contributions to our customers. This thinking is what has kept us ahead. The benefits to you and your organisation are simple: the best qualified service engineers can identify problems and implement solutions faster, saving you money, downtime and extending machinery life. On-site diagnosis, troubleshooting and repair — Resolve a technical issue quickly, and request a highly skilled technician to provide on-site problem resolution with just one call. This FLT Seal controller is an all-in-one, palm-size PLC with industrial PLC routines. The beautiful 3.5” ( 320 x 240) HMI touchscreen enables convenient data entry and display of machine status. 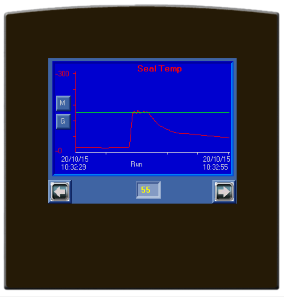 Temperature and timers are displayed on several screens, including colour Trend graphs. Of course the screens are multi language for convenient personal operation. 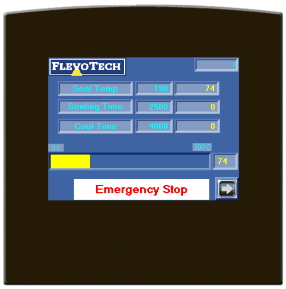 The controller monitors all machine movements for safety purposes and in case of emergency the machine movements are cut off and appropriated messages are displayed on the screen. Bigger screen size : 4,3” (480×272) or even 7” (800×480) . GPRS/GSM or modem Support and support for sending/receiving SMS messages. Remote access/update utilities for support purposes. Programming: Extra programming can be made for additiononal functionalities. Ask for our possibilities. 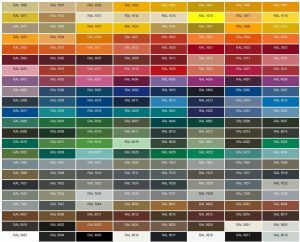 How amazing would it be to pick out a machine with your custom picked colors? Or maybe even the color of your company? We are now offering an extended range of colors in our producs and machines, so you will never be plain again. With this new feature, the customer can design his own version thats suitable with their company colorings. FLT Machinery is working with RAL pallette colors. We are able to offer you extended services, that includes color coating options with the machines in an color of your choosing. All our machines are coated in RAL 6018, green matt.